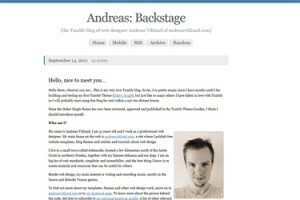 The second Tumblr theme from andreasviklund.com is now available in the Tumblr Theme Garden. It is called Daleri Plain, and it has a layout similar to Daleri Single but with less colors, serif fonts (Georgia) and rounded corners. Daleri Plain allows you to set an accent color for the design, which is used for menu and header details as well as for the color of most links. Try it out, play around with it and let me know if you like it. I like this theme. Thank you for sharing it. I made very basic customisations to add the ‘Ask’ and ‘Likes’ buttons to the top level navigation. Other than that, it would be great if it supported Google Analytics natively. But overall, I like the theme.